This is our final instalment of the answers supplied by the Department for Education to your questions. We grouped your questions into related themes and over the past week we've run the replies baed on SEND provision and EHCP issues. 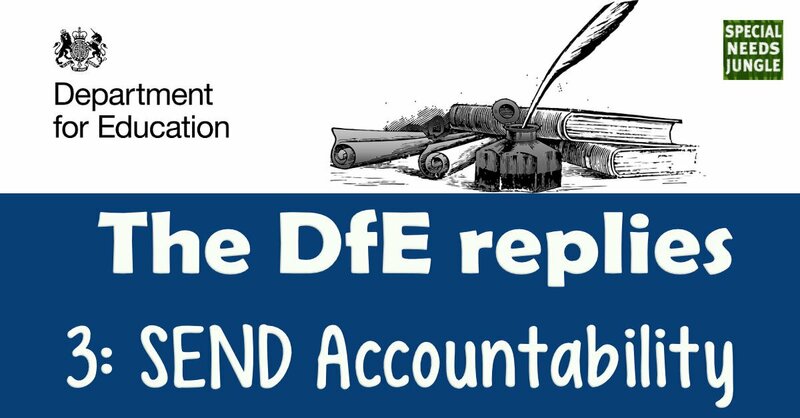 Today is the one about accountability, which is a big issue for many parents who are frustrated by the injustice and imbalance of power there can seem to be in the system and that the reforms, coupled with the cuts, have only made it worse. Now, don't expect these answers to be revelatory - the DfE were never going to come out and say they'd be frogmarching offending LAs to the Tower. But if you were in doubt about what the law says, these answers may help. Again, leave your views here on the blog comments please, so they can be seen by all and not just those who happen to spot it on Facebook. What support is available to parents and young people who wish to complain about the SEND support that they are getting in schools? The publication, ‘Special educational needs and disability: a guide for parents and carers, contains a wealth of information about rights of appeal and the support services available – see the ‘Challenging or disagreeing with decisions’ section in the guide. Many issues can be resolved through local conversations with your child’s school. This could be with either, or both, the class or form teacher and the SENCo and could involve senior school leaders if needed. Where a pupil is receiving SEN support, schools should talk to parents regularly to set clear outcomes and review progress towards them, discuss the activities and support that will help achieve them, and identify the responsibilities of the parent, the pupil and the school. The SEND Code of Practice is clear that schools should meet parents of those identified at SEN Support at least three times each year (paragraph 6.65), but parents can request more meetings than this if needed. "The SEND Code of Practice is clear that schools should meet parents of those identified at SEN Support at least three times each year (paragraph 6.65), but parents can request more meetings than this if needed." A copy of every school’s complaints procedure should be easily available and is often published on the school’s website and the school’s SEN Information Report should include arrangements for handling complaints. Parents can also ask the local authority to use their disagreement resolution service to help resolve issues with a school, if the school complaints route doesn’t resolve things. Parents and young people can appeal to the First-tier Tribunal (Special Educational Needs and Disability) if they disagree with certain decisions made by their local authority in relation to EHC needs assessments and plans. Appeals must be made within two months of the date of the decision that is causing concern, or within one month of the date of the mediation certificate, whichever is the later. Before making an appeal, parents and young people must contact a mediation adviser to consider whether mediation might be a way to resolve the disagreement with the local authority. The only exception to this is where a parent or young person wants to make an appeal only about the school or other educational institution named in the EHC plan – in these circumstances, there is no obligation to contact a mediation adviser. How is the Government holding local authorities to account for their performance? We use intelligence from a wide range of sources to understand where services are working well, where they could do better, and to focus our resources on where we can make a difference. This includes activity the Government funds, surveys, research and SEND inspections, feedback from parents and from our team of professional SEND advisers who work directly with local authorities. We are clear that improvement is an on-going process and where the Department identifies that local area performance is a particular concern we work with partners, such as NHS England, to engage with senior leaders, and have seen a proactive and positive response. We have been encouraged by the local authority and Clinical Commissioning Groups’ (CCGs) joint ownership of SEND Ofsted/CQC inspection findings. Inspected local authorities have been very proactive in sharing their learning and this has been a key feature of well-developed regional working, including through the SEND local authority regional networks, funded by the Department for Education. Although not formally required to do so, areas with no significant concerns are also producing action plans to address their areas for development. Following the publication of a SEND inspection report containing significant concerns, the Department immediately follows up, working with NHS England to do so. Ministers also write to local authorities and CCGs in all local areas that have had their inspection report published; and write again, after 12 months, to those areas identified by the inspections as having significant weaknesses. What is the Government doing to ensure high quality SEND provision within every local area? Local authorities, as well as schools and other education providers, have important responsibilities for children and young people with SEND, set by the Children and Families Act 2014. This must be reflected in the published local offer of SEND provision and services. The Act requires local authorities to keep the provision for children and young people with SEN and disabilities under review (including its sufficiency), working with parents, young people, and providers. We have provided guidance on carrying out these strategic reviews. £215m in capital funding has been provided from 2018 to 2020 for local authorities to increase school capacity and make it easier for children with special educational needs and disabilities to access good school places. Local authorities, through consultation with local stakeholders, should decide how best to spend their allocation to meet local needs. The Department committed £23m of additional funding in 2016-17 to support strategic planning of high needs provision. What is the Government doing to improve joint working between education, health & social care services? The Ofsted / CQC local area SEND inspections are proving to be a strong lever to bring together local authorities and their CCG counterparts. We are also trialling extending powers of the First-tier Tribunal (SEND) to make non-binding recommendations about the health and social care aspects of EHC plans. The trial will apply to decisions made and EHC plans issued/amended from 3 April 2018 and will run for two years. To support improvements in joint working, we are funding a consortium of partners, including the Council for Disabled Children and Contact, to work with health and social care partners. In addition, the 2017-18 NHS Provider Contract for NHS Trusts, includes, for the first time, a requirement to report on meeting the 6-week deadline for health input into EHC plans. The Transforming Care programme is working to improve services across education, health and care for children and young people with learning disabilities, autism or with behaviours that challenge and/or a mental health condition. Through this, NHS England published guidance on commissioning quality services and provision for children, including promoting joint working. The Department for Education also published, in November, the Lenehan Review of residential specialist schools and colleges which explored problems in this area. We are committed to responding to the review and will establish a National Leadership Board for Children and Young People with High Needs, reporting to the Minister for Children and Families. How does the Government intend to implement the UN Committee’s Concluding Observations following their recent Examination of the UK governments SEND provisions? We have structures in place for monitoring and supporting the implementation of the Children and Families Act 2014 reforms. We will be augmenting these with the new National Leadership Board for Children and Young People with High Needs announced in November as part of the launch of the Lenehan Review of residential specialist schools and colleges. Children and young people with SEND and their families are an integral part of those structures. The most effective way to ensure appropriate follow-up to the UN Committee’s Concluding Observations is to ensure that consideration of the issues is addressed in those contexts.